Paul Reiser brings his trademark warmth and razor-sharp wit to bear on observations about parenting, marriage, and mid-life in Familyhood, his new collection of essays. Fueled by his experiences of raising two young sons with his wife of twenty-two years, Familyhood looks at the funny truths, heartbreaks, and small victories of being a family today. In the number one New York Times bestseller Couplehood, Paul Reiser wrote about the highs and lows of falling in love and getting married-and the heartbreak and hilarity that comes with it. In Babyhood, he turned his sharply observant eye to the experiences of having a brand-new family. And now in Familyhood, Reiser shares his observations on parenting, marriage, and mid-life with the wit, warmth, and humor that he's so well-known for. From the first experience of sending his two boys off to summer camp-the early feelings of gleeful freedom in an empty house, to realizing how empty the house actually was-to maneuvering the minefield of bad words learned at school, this hilarious new book captures the spirit of familyhood, the logical next frontier for Reiser's trademark perspective on the universal truths of life, love, and relationships. 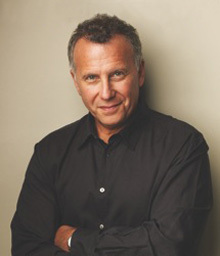 Multiple #1 New York Times bestselling author, actor, and stand-up comedian Paul Reiser has appeared in many films and television shows, including co-creating and starring in the critically acclaimed NBC series, Mad About You, which garnered him multiple Emmy, Golden Globe, and Screen Actors Guild nominations. He lives in Los Angeles with his wife and two sons. Published by Hyperion in May, 2011. In this witty, insightful new Kindle Single, Paul Reiser — the #1 New York Times bestselling author and star of TV’s classic sitcom Mad About You — recalls his memorable encounters with legendary Hollywood greats whose advice, friendship and example showed him how to be a better artist and better man. By turns touching and comic, Reiser shares the intimate details of inspiring backstage moments with comedy greats such as Bill Cosby, Carl Reiner, Neil Simon, Carol Burnett, and Peter Falk, and what they taught him about life, work, and creativity. Finding himself at a loss for advice as his own children come of age, Reiser invokes an age-old joke — “How do you get to Carnegie Hall?” — to remind us that some things never change, especially the eternal value of hard work and practice. It’s a lesson consigned with wisdom, humor and an unabashed love of life, by one of America’s most beloved comedians. Published by Amazon Digital Services in 2014.